Mario David Pedraza moved with his parents, Roberto Antonio Pedraza and Martha “Pati” Ruiz Corzo, and his brother, Roberto, from Queretaro City, Mexico, to the rugged mountainous region of the Sierra Gorda in northern Queretaro State when he was five years old. He was, at the time, receiving cortisone and oxygen treatment for chronic asthma, and the doctors had told Pati that Mario would be unlikely ever to be able to play sports. The move to the countryside was, he reports, “the biggest gift I have ever received,” and he has never had a moment’s desire to return to city life. 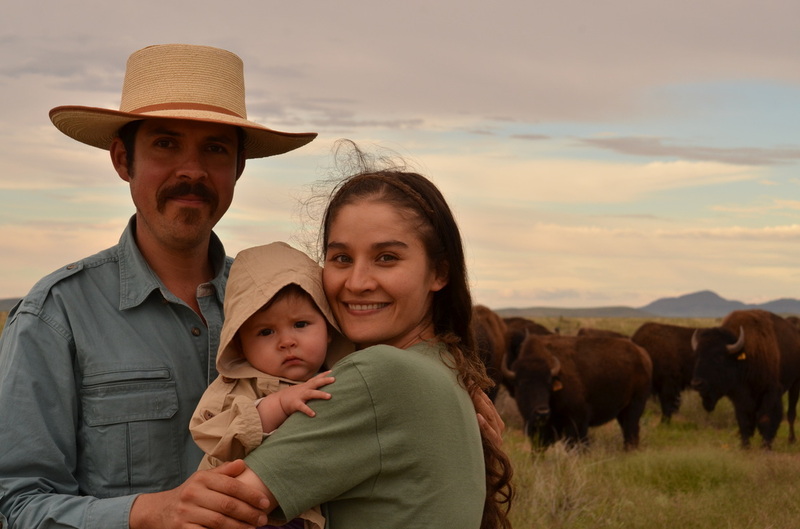 Mario David Pedraza with his wife, Martha, and their infant daughter, Marta Emilia, in Janos, Chihuahua. In order to motivate those people of Sierra Gorda who earn their living from the land to participate in the healing of the Sierra Gorda, Mario has dedicated himself to demonstrating the holistic value of "soil stewardship" to the region's farmers and ranchers. Under Mario’s guidance, Grupo Ecologico has also acquired skills in holistic management, a regenerative decision-making framework for grasslands management developed by the Zimbabwean biologist and game ranger Allan Savory. Savory had observed that when large herds of wild herbivores grazed freely they actually enhanced the biodiversity and soil health of the land. He created strategies for managing domestic livestock mimicking this natural grazing method. "Holistic management is quite different from the conventional approach to cattle farming," Mario explains, "where cattle are permitted to overgraze, eroding the soils, and ultimately creating unprofitable deserts." As it heals the landscape and the soil, holistic management also acts as a powerful carbon sequestration agent. Grupo Ecologico received its training in holistic management from Ivan Aurelio Aguirre, a certified educator of the Savory Institute’s Sonora, Mexico, Hub. Grupo Ecologico has been working closely with the Savory Institute since 2010, and is now one of three Savory hubs in Mexico, along with those in Sonora and Chihuahua. Five local practitioners have now been trained by the Savory Institute in holistic management and are sharing their knowledge with a growing community of Sierra Gorda farmers and cattle ranchers. “We work with small communities and small farmers who often don’t know how to read and write,” Mario explains. “Right now we have thirteen farms using both holistic management and permaculture techniques, and about 150 agriculture parcels(about 10,000 hectares) are now implementing all the principals." A typical small farm implementing holistic management might have 50 to 100 head of cattle. “Using the principles of holistic management, we see the cattle as a tool to improve the ecosystem process,” says Mario. “But our practice must at the same time respond to the holistic context of every farm or producer." Mario explains that from a holistic management perspective it is impossible to separate agriculture from cattle breeding. “Both are about ‘the culture of the soil,’” he says. “Here, in the past, we have never taken care of the soil. Our mission now is to create our own standard for doing that. After all, we come from the soil, we are part of the soil, and we have to nurture it to have food and all the other service that comes from it." Among this diverse group of students of the soil are women farmers, many of whom work their land alone because husbands, fathers, and brothers have left for work north of the border. “ There are 80 lady farmers learning to produce vegetables where before it was not part of the culture,” says Mario. Visitors from all over the Sierra Gorda and the country have descended on Mario’s own farm, where he lives with his wife, Martha, and their infant daughter, Marta Emilia, to observe the results of his holistic grazing practices and the fecundity of his biointensive orchards and vegetable gardens. Within one year, Mario reports, the effects of soil improvement had become evident — the plants were bigger and more colorful, water was more abundant and cleaner. “What we share is a very inexpensive knowledge,” he asserts. “It is very expensive to buy agrichemicals. On the other hand, if you teach farmers how to ferment manure and use microbiology it costs very little. As soon as they put it in practice and see how it works they are convinced." Grupo Ecologico also monitors soil health scientifically, measuring for carbon capture utilizing holistic biologic monitoring of soil carbon contents with the Soil Carbon Coalition methodology. Mario reports that the Mexican not-for-profit Gonzalo Rio Arronte has provided funding for Grupo Ecologico’s soil reclamation work for the past few years. To secure funding for the future, Grupo Ecologico recently presented a proposal to Mexico’s Secretariat of Agriculture, Livestock, Rural Development, Fisheries and Food (SAGARPA) to train an additional 45 holistic management educators in several states of central Mexico. “We are still waiting to hear if our plan is going to be funded,” Mario reports. Meanwhile the environmental agency of Queretaro State is partnering with Grupo Ecologico to develop a framework for a new ecosystem services compensation mechanism that would be funded by offset fees paid by those who develop agricultural or forest land. Mario and his team are working on the protocols for this scheme. He reports that Grupo Ecologico stands ready to partner with big ranchers as well as with those farming on a half-hectare. 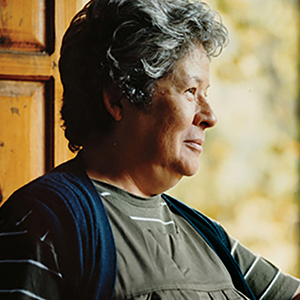 Read Pati Ruiz Corzo's story of a remarkable adventure and spiritual quest in Mexico’s Sierra Gorda, and of a not-for-profit that has empowered impoverished farmers and ranchers to assume the role of regenerators of one of the world's most biodiverse regions.